Is Apple already trialling two iWatch prototypes? Will this be arriving via Amazon drone in 2014? 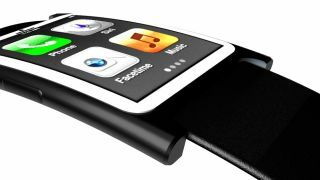 According to a 'leak', Apple is already trialing two iWatch prototypes with an estimated launch date of October 2014. G4Games, which cites Ctech as a source, claims that the iWatch will be released in October next year, possibly alongside a new iPhone. Much in the same way Samsung released the Galaxy Gear and Galaxy Note 3 together. The website also makes the claim that the prototypes that are currently being tested will feature wireless charging of up to 1 meter away, and house a 100MA battery. Apple, however, is yet to decide on a screen size for the smartwatch, the website reports. TechRadar previously reported that the iWatch may come in different sizes catering to both male and female wrists - a rumour that came from the Korean Herald. But the fact is that we don't even know if the iWatch even exists. Apple has never confirmed or denied its existence and it could well be that these specification and style rumours are unintentionally doing the job for Apple. Whether it exists or not, stay tuned with TechRadar for the latest information.